We are all talented. We all have a gift in us. No person is like the other. There may be similarities in personalities but each individual is unique. Each have been given a unique talent. When you acknowledge your gifts, you could grow into your best self. One who can impact the world in a positive way. That’s what talent plus fiery courage does. It equals being a genius. There’s a person who can sing effortlessly. Even though he’s not trained, he can create beautiful harmony and melodies. He sings songs that are pleasing and delightful to the ear. This person always knew that he’s got this talent and would not mind having success. Yet he is not successful. Why? This is because he lacks the courage to pursue and nurture his talent. So then this person feels disappointed. If he really wants to shine through his talent, he ought to be fired up with mighty courage. Talent plus fiery courage equals being genius. The wind blowing in the same direction helps the aeroplane. The plane get’s it’s momentum supported by the wind. In the same way, your talents also take off, fly and get supported with the help of the fiery courage within you. Are you ready to take off to achieve your dreams? The impossible is possible. How? You only have to truly believe and then take a leap of faith. Believe that what you dream of you can achieve. You already have all the abilities, all the skills and all the talents that you need to achieve your dreams. Trust the process of life and show courage. Going through the process, going through the journey and then beyond the journey. The gift of courage is in you. You can always exhibit this. We have heard many stories where ordinary people did extraordinary things. Let’s not go far. Let’s take the example of Prime Minister of India, Shri Narendra Modi. He himself said in one of his interviews that he was an ordinary chaiwala (Tea seller). Yes, as a kid he worked in a small local tea shop. A scene of child labour we often see in India. It is only with the consistent pursuit of becoming better, he overcame every obstacle. He now sets ideal living example of leadership to the world. You can achieve anything in life when you set your mind to it. When your talents are fuelled by courage, you will make strides and will inspire the world. What is it that I love to do? What can I offer to the world, even if it is a small thing, that is worth to pursue? Know this and then take action. Muster up your courage. We invite you to share. Write your comments below to inspire others. 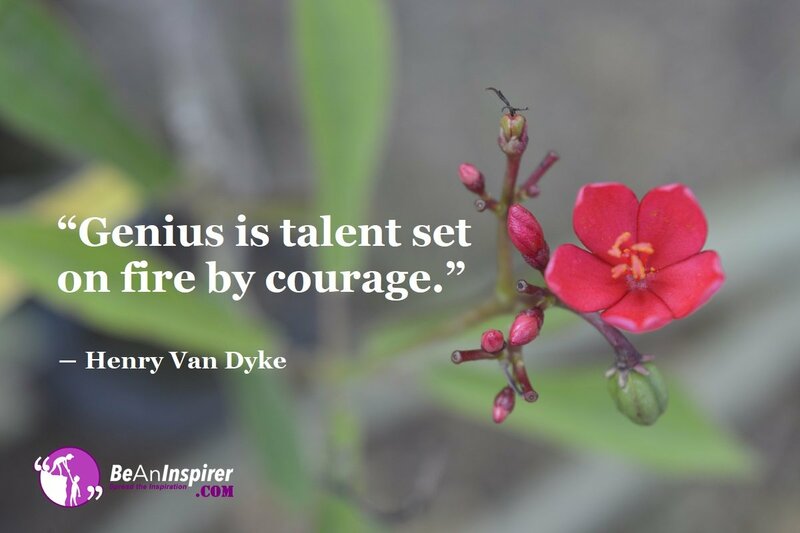 Do you agree that talent plus fiery courage equals being genius?